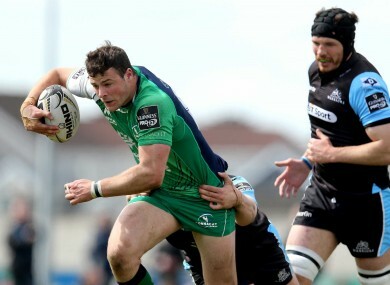 Robbie Henshaw getting his leg drive going on Glasgow's last visit to Galway in April 2015. 21 GAMES DOWN, one to go before the knock-out rounds of the Pro12 and there’s still a lot to play for. Just three points separate the top three, Scarlets are just a point off fourth-placed Ulster and Ospreys won’t have given up hope of pulling ahead of Munster in sixth. With the final day bringing all six fixtures to a synchronised 15.00 Saturday kick-off time, tournament organisers today announced which games had been picked up by broadcasters. Treviso’s visit to a Leinster side with a point to prove will be the only game not available live on the box. So if you want to see how Leinster react to their thrashing in Belfast you’ll have to go along to the RDS yourself. Connacht v Glasgow Warriors, TG4 and BBC Scotland.Munster v Scarlets, S4C. Ospreys v Ulster, BBC NI and Sky Sports. Leinster v Treviso, no broadcaster. Edinburgh v Cardiff, BBC Wales. Now, go forth and make plans for the weekend. Email “Time for the final round of Pro12 games, here's where you can watch your province in action”. Feedback on “Time for the final round of Pro12 games, here's where you can watch your province in action”.